Holding a khanda (double-edged sword) in his right hand and his severed head in his left hand Baba Dip Singh Ji (1682-1757) sacrified his life fighting against oppression for the liberation of Sri Harimandar Sahib, Amritsar. He was born on January 26, 1682 in Pahuwind village, which is 40 kms south-west of Amritsar and falls in District Tarn Taran of Punjab. His parents Bhai Bhagta Ji and Mata Jiuni Ji were very religious minded. They nick-named him as ‘Deepa’. His father belonged to Kharra sub-caste of Jat Sikhs and was a farmer. As a small child Dip Singh Ji fell seriously ill and his mother while praying to God for his recovery prayed that her son should not die of illness and may rather die as a martyr. Her prayer bore fruit and martyr did he become at the age of 75 years. His father was a well read person and taught him Gurmukhi. Dip Singh Ji started reciting Japuji Sahib and soon he started reciting this paath101 times daily and continued this practice throughout his life. The recitation of thispaath 101 times daily instilled in him a deep religious fervour and a huge amount of energy. Japuji Sahib is the opening composition of Sri Guru Granth Sahib, the holy book of the Sikhs. Preceded by Mul Mantra which is the basic statement of the Sikh religion, Japuji Sahib comprises an introductory sloka and 38 stanzas and a concluding sloka. Japuji Sahib is generally recited early in the morning. One recitation of this paath takes about 10-15 minutes. The sacrifice of Baba Dip Singh Ji Shahid made for the liberation of religious places will shine perenially in the Sikh history and he will be remembered for all times to come for his steadfastness and valour. On the Baisakhi day of 1699 when Sri Guru Gobind Singh Ji established the initiation ceremony for Sikhs by initiating Panj Piaras and created Khalsa at Anandpur Sahib in District Ropar of Punjab, Guru Sahib’s message to get initiated reached all nooks and corners of the country. On the Baisakhi day of the following year i.e. in 1700, a large number of Sikhs came to Anandpur Sahib from places far and near to receive the vows of the Khalsa. As a young boy of 18 years Dip Singh Ji also reached Anandpur Sahib and received the vows of the Khalsa from Sri Guru Gobind Singh Ji. He stayed there to study the sacred texts under Bhai Mani Singh Ji and then returned to his village. In 1706, he rejoined Sri Guru Gobind Singh Ji at Talvandi Sabao (Damdama Sahib) 28 kms south-east of Bathinda in District Bathinda of Punjab. Before leaving for Deccan on Oct. 30, 1706, Sri Guru Gobind Singh Ji assigned to Dip Singh Ji the duty of teaching the Sikh scriptures, disseminating Sikh philosophy and training the Sikhs in the martial arts. Thus, Dip Singh Ji stayed behind at Talvandi Sabo to serve at the Gurdwara Damdama Sahib. At Talvandi Sabo, as per the directions of Sri Guru Gobind Singh Ji he spent his time explaining the teachings of Sri Guru Granth Sahib to Sikh sangat. 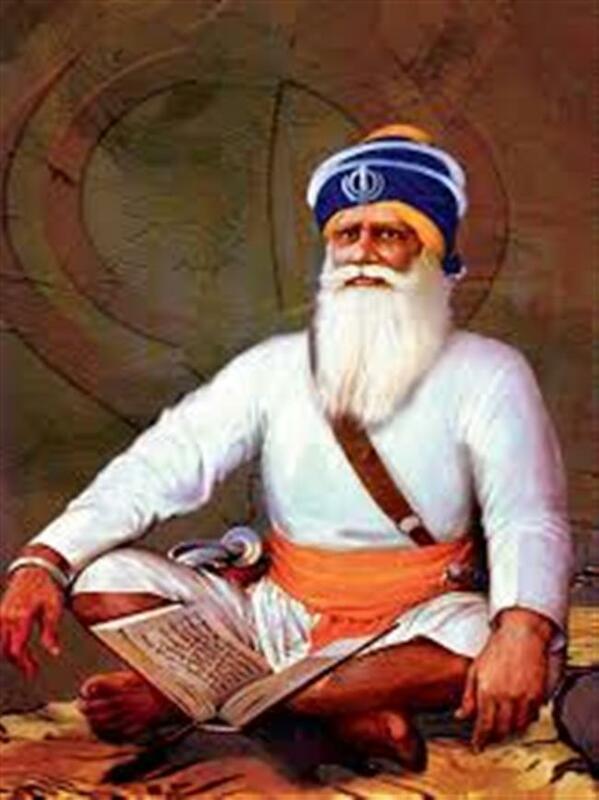 He also organised a Sikh jatha (fighting group) and trained the members of this jatha in martial arts. In 1709, he decided to cooperate with Baba Banda Singh Ji Bahadur whom Sri Guru Gobind Singh Ji had sent from Nanded Sahib, Maharashtra towards Punjab to counter the tortures being inflicted on the Sikhs by the Mughals. He gave full cooperation to Baba Banda Singh Ji Bahadur in the battles fought by Baba Banda Singh Ji Bahadur against the Mughals. When Baba Banda Singh Ji Bahadur attacked Sadhaura which falls in the District Ambala of Haryana, along with his jatha of brave Sikhs he reached Sadhaura. In this battle Usman Khan was killed who on March 21, 1704 had tortured to death Pir Buddhu Shah Ji a Muslim Saint for having helped Sri Guru Gobind Singh Ji in the battle at Bhangani in Himachal Pradesh by taking alongwith him his brother, four sons and 700 followers. Taking revenge from Wazir Khan was the top priority of Baba Banda Singh Ji Bahadur because on December 11, 1705 he had ordered that the two younger sons - Sahibzada Fateh Singh Ji and Sahibzada Zorawar Singh Ji aged 7 years and 9 years respectively be paved alive in a wall at a place 5 km. from Sirhind. But the wall being constructed by the mason crumbled and inspite of his best efforts he could not complete it. On December 12, 1705 as per the orders of Wazir Khan these two younger sons were executed. On May 12, 1710 when to conquer Sirhind Baba Banda Singh Ji Bahadur fought the battle near the twin villages of Chapar-Chiri Large and Chapar Chiri Small Baba Dip Singh Ji played a significant role in it. These villages fall in the Tehsil Kharar of District Sahibzada Ajit Singh Nagar, Punjab, they are 1½ - 2 km. apart and are at a distance of 16 miles from Sirhind in the north-eastern direction and 10 miles from Banur in the north-western direction. In this battle Wazir Khan who was at that time Governor of Sirhind was killed and Baba Banda Singh Ji Bahadur emerged as victorious. Two days after the battle at Chapar Chiri, i.e. on May 14, 1710 Baba Banda Singh Ji Bahadur and his army conquered Sirhind. After these victories Baba Dip Singh Ji along with his jatha left for Talwandi Sabo via Anandpur Sahib and on the way he stopped for one day at Solkhian which falls in District Ropar and on the Chandigarh-Ropar road is at a distance of 10-11 kms. from Ropar. As per folk memory, after these battles Baba Dip Singh Ji helped in dressing the wounds of the injured Sikhs. He also helped in conducting the injured Sikhs to their respective homes. The soldiers who succumbed to their injuries were cremated by him at Solkhian. At this place now stands Gurudwara Yaadgaar Shriman Dhan Dhan Baba Deep Singh Ji Shaheed, where Akhand Paths are being recited continuously. Baba Dip Singh Ji helped Baba Banda Singh Ji Bahadur in the campaigns against the Mughals until 1714. After that he went to his headquarter at Talvandi Sabo. A very unique contribution which Baba Dip Singh Ji made during his stay at Talvandi Sabo is that in 1726 he made four hand written copies of Sri Guru Granth Sahib from the recension prepared by Sri Guru Gobind Singh Ji with the assistance of Bhai Mani Singh Ji and Dip Singh Ji during his stay at Talvandi Sabo. These copies were sent to the four Takhts (seats of reverence) (i) Sri Akal Takht Sahib, Amritsar, Punjab (ii) Takht Sri Patna Sahib, Bihar (iii) Takht Sri Keshgarh Sahib, Anandpur Sahib, District Ropar, Punjab (iv) Takht Sri Hazur Sahib, Abchal Nagar, Nanded, Maharastra. It is worth mentioning here that Sri Guru Granth Sahib which consists 1430 pages is treated by the Sikhs as their last Guru and is held in great veneration by them. The recitation of this holy book once continuously without any interruption takes about 48 hours. In 1732 when Manjh and Bhatti Rajputs in collaboration with the faujdar of Jallandher and Nawab of Malerkotla had besieged S. Ala Singh at Barnala, Baba Dip Singh Ji went to Barnala to rescue him. In 1733, the Mughal Governor of Lahore realizing that it was a tough job to tackle with the brave Sikh forces who stood in his way of spreading Islam decided to end his warring attitude and lure the Sikhs by offering them nawabships and jagirs. But considering the offers of the Mughal governor only as an eye-wash Dip Singh Ji along with his jatha came to Amritsar and joined Nawab Kapur Singh to from a joint Sikh force called the 'Dal Khalsa'. For administrative reasons this force was sub-divided into two groups - Buddha Dal (the army of elders) and Taruna Dal (the army of youngers). Taruna Dal was further split-up into five jathas (fighting bands) and Dip Singh Ji was given the command of one of these five jathas. By this time, because of reverence for him he came to be called ‘Baba Dip Singh Ji’. On March 29, 1748 which was the day of Baisakhi, the Sikhs chose S. Jassa Singh Ahluwalia as the supreme commander of the Dal Khalsa. In 1748, these jathaswere redesignated as misls and these misls took charge of ensuring peace, providing protection to the people from oppression and providing security in the area relegated under their authority. For providing these services, the misls collected a specific portion of the revenue. Baba Dip Singh Ji was founder of Shahid Misl as well as the Damdami Taksal i.e. Damdama School of Sikh Learning. Shahid Misl was incharge of the area falling south of river Sutlej but Baba Dip Singh Ji remained stationed at Talvandi Sabo. At Talvandi Sabo, the underground burj which he got constructed and in which he lived and prayed during this period is still intact and is known as Burj Baba Dip Singh Shahid. It is a 20 meter high tower with a dome which at the top adjoins the north-easten corner of Takht Sri Damdama Sahib, which is one of the five Takhts, i.e. seats of reverence for the Sikhs. Baba Dip Singh Ji got a well sunk near this place which still supplies drinking water to the complex. Thousands of Sikh pilgrims visit this tower daily to pay homage to Baba Dip Singh Ji. A darshan (holy glimpse) of this tower is a revealing experience in itself. The fittings and articles inside the tower, alcove for putting divas (earthern lamps) for light give a glimpse of the possible prayer postures of Baba Dip Singh Ji, his seating and bedding arrangement etc. The pilgrims claim that mere entry into this tower instils in them a deep feeling of tranquility. S. Charhat Singh who became the grand-father of Maharaja Ranjit Singh, the Sikhjathas closely followed Abdali from Lahore to Indus river and harassed his forces. Before returning to his homeland Abdali installed his son Taimur Shah as Viceroy of Punjab and appointed Jahan Khan as his deputy general. As a vengeance for the harassment done to him by the Sikhs Abdali directed Taimur and Jahan Khan to exterminate all Sikhs, destroy Amritsar, the holy city of Sikhs and fill in the sarovar(sacred pool) at Harimandar Sahib with debris. In May 1757, Jahan Khan reached Amritsar and started acting as per the directions of Abdali. He razed to the ground the Sikh fortress at Ram Rauni and filled up the sacred sarovar with debris. TheShahid Misl under the leadership of S. Gurbaksh Singh Ji tried to defend the holy premises but were not very successful. When the news of the desecration of holy places reached Baba Dip Singh Ji at Talvandi Sabo, who was at that time incharge ofGurdwara Damdama Sahb he immediately set out with his jatha towards Amritsar. On his way, many Sikhs joined him and by the time he reached Tarn Taran Sahib which is 24 kms south of Amritsar, he had mustered a force of 5000 soldiers. At Tarn Taran Sahib, Baba Dip Singh Ji drew a line on the ground with his khanda and said that those Sikhs who were willing to fight until death should cross that line and join him. All of the Sikhs who were present crossed the line and joined him. At this place where he had drawn the line Gurdwara Lakeer Sahib has been established. On November 11, 1757 on learning about the march of the Sikh forces towards Amritsar Jahan Khan set out with his army to give them a tough battle and reached near the village Gohlvar, which falls in District Tarn Taran and on the Tarn Taran - Amritsar road comes 14-15 kms before Amritsar. At this place he barred the way of Baba Dip Singh Ji’s troops as a result of which a fierce battle ensued at this place. In the meantime Haji Atai Khan joined the Mughal forces alongwith his 20,000 soldiers. Baba Dip Singh Ji continued to push back the Mughal troops towards Amritsar and reached village Chabba which is at a distance of 7 kms from Amritsar on the Tarn Taran - Amritsar road and falls in District Amritsar. At this place the Mughal Commandar, a young man challenged Baba Dip Singh Ji, a 75 year old stalwart commander that if he considered himself to be a very brave warrior he should fight with him alone. Baba Dip Singh Ji accepted the challenge. Both the Generals alighted from their horses and started fighting. In a fierce battle which ensued both of them struck each other simultaneonsly in which Mughal Commandar got killed and Baba Deep Singh Ji’s sacred head got severed from his sacred body. But to the astonishment of all present Baba Dip Singh Ji took hold of his severed head in his left hand and continued to march towards Sri Harimandar Sahib fighting with his khandaweighing approximately 37 pounds held in his right hand. Most of the soldiers in the Mughal army got awe stricken and fled away. Thus fighting Baba Dip Singh Ji reached the precincts of the holy shrine, the circumambulatory terrace of Sri Harimandar Sahib and fulfilled his pledge to liberate Sri Harimandar Sahib from the clutches of the enemy. To commemorate his commitment and bravery, at the exact place where he breathed his last in the parikarma i.e. circumambulatory terrace of the sarovar surrounding Sri Harimandar Sahib Saheed Bunga Baba Dip Singh Ji has been constructed. In the village Chabba Gurdwara Sri Tahla Sahib has been established at the place where the sacred head of this brave warrior got separated from his sacred body. At the place where his sacred body was cremated Gurdwara Shahid Ganj Sahib Baba Dip Singh Ji has been established. This place is close to Sri Harimandar Sahib and Gurdwara Ramsar Sahib. On this site S. Jassa Singh Ji (d.1803) of Ramgarhia misl had raised a memorial platform which was later on developed into a Gurdwara by Akali Phula Singh Ji (d. 1823). Every year millions of pilgrims pay their homage at Gurdwara Sri Janam Asthan Baba Dip Singh Ji, village Pahuvind, District Tarn Taran, Shaheed Bunga Baba Dip Singh Ji, Sri Harimandir Sahib, Amritsar, Gurdwara Shahid Ganj Baba Dip Singh Ji, Amritsar, Gurdwara Sri Tahla Sahib, village Chabba, District Amritsar, Gurdwara Lakeer Sahib, village Gohlvar, District Tarn Taran and Gurdwara Yaadgaar Shriman Dhan Dhan Baba Dip Singh Ji Shaheed, Solkhian, District Ropar on Baba Dip Singh Ji’s birthday i.e. January 26 and on November 11 his martyrdom day. This year i.e. in 2019 Baba Dip Singh Ji's birthday is being celebrated on January 27.